Ever wondered how hazardous those long lasting plastic chairs (that we use uncomfortably every day) prove to be to the environment? Their non-biodegradable nature has led ‘plastic pollution’ to adversely affect the habitat around us on a very large scale. However, there is some good news! Vancouver’s transdisciplinary design firm AFJD design studio came up with a unique and interesting way of diminishing this problem by using an ingredient that might be easily available in our kitchens. Can you guess what that might be? Growing furniture from mushrooms? That almost sounds bizarre. Although we never imagined the use of mushrooms outside the realms of our chopping boards or cooking pans, AFJD design studio - headed by Joe Dahmen and Amber Frid-Jimenez - broke this convention by identifying the major property found in mushrooms = its roots! These roots turned out to be essential for their products, since "they grow"! 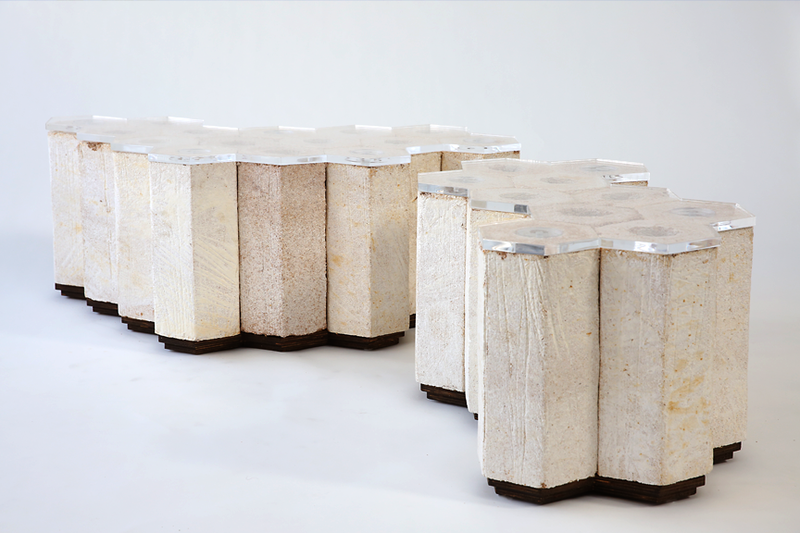 Therefore, instead of manufacturing, they decided to ‘grow’ their furniture from the mycelium biocomposites. 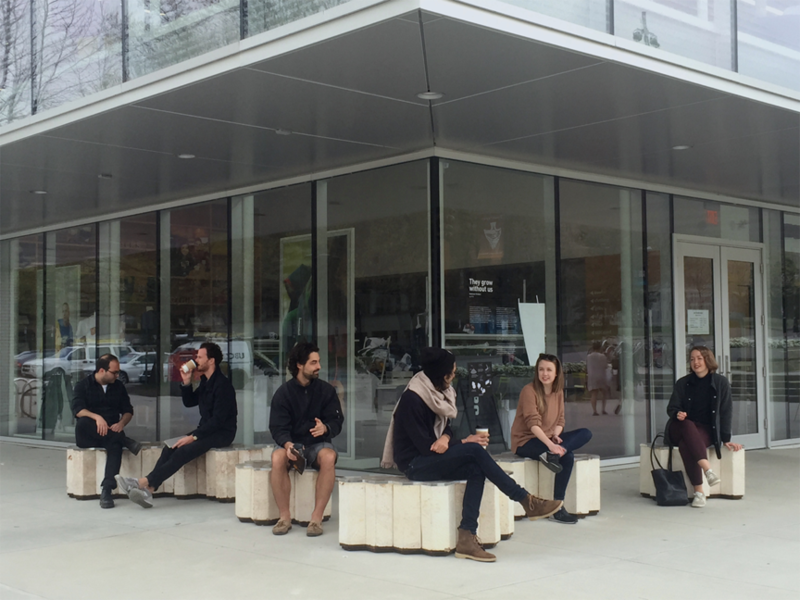 Six stylish benches, with a contemporary look, were installed outside the University of British Columbia bookstore, as part of an innovative design project. Dahmen, an assistant professor at UBC School of Architecture and Landscape Architecture and Frid-Jimenez, Canada Research Chair in Design and Technology at Emily Carr University of Art and Design, had been working with recycled polystyrene blocks on an architectural installation (same material as plastic chairs). They soon discovered the toxicity of polystyrene that contains hazardous substances such as styrene and benzene and decided to look for more eco-friendly alternatives. 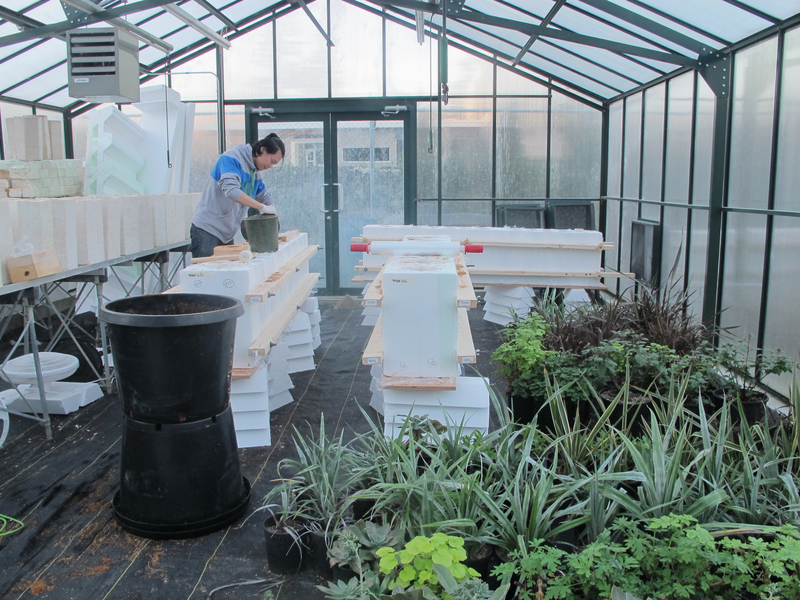 By collaborating with the university students and staff, through UBC’s social-economic-ecological development studies (SEEDS) sustainability program, they established an expansive method to grow mycelium biocomposites using oyster mushroom spores and alder sawdust, two local materials. 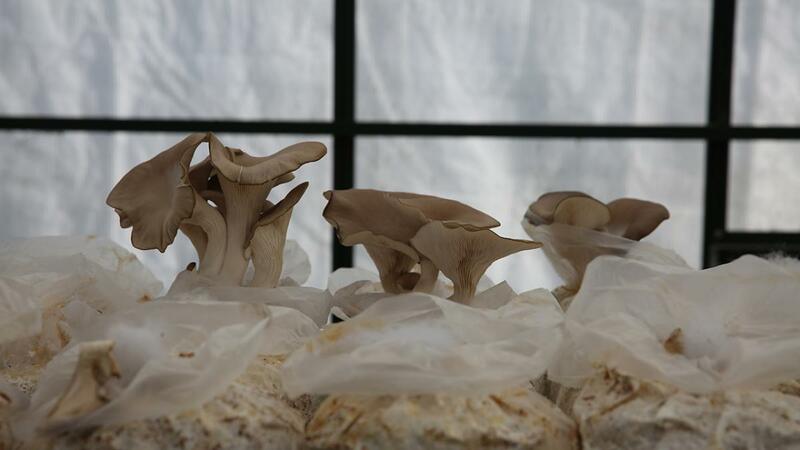 Mycelium (mushroom roots), found in mycelium biocomposites, develop in free cellulosic material like sawdust. Therefore, they sanitised alder sawdust, mixed it with supplements, and immunised it with the spores of Pleurotus Ostreatus. The mycelium grew in the sawdust for two weeks. The moulds were evacuated after five days and to stimulate the growth of Chitin (which is a strong polysaccharide), the blocks were wrapped in Saran wrap. The blocks, after drying, were congregated to form benches and covered with clear acrylic. The odd honeycomb shape of the benches was inspired by an actual wasp’s nest. If grown half a meter more in thickness, moulds and bacteria contaminate the mycelium biocomposites. Therefore, the compact hexagonal grid of a honeycomb that has the expansive and dimensional nature and the flexibility to grow in all directions, encouraged the makers to give the benches this shape. It is a great approach to making useful furniture along with keeping environmental concerns. Non-organic materials such as Styrofoam and plastics harm the environment by releasing toxic and chemical additives, polluting land and oceans. On the other hand, mushrooms are not only organic but also completely biodegradable. They totally decay when treated with soil and make the other materials found waste stream accessible to other organisms by separating them. They also require much lesser energy to create compared with Styrofoam. Therefore Dahmen analyses them as being great alternatives for various roles such as in the field of architecture. "The average age of commercial buildings in North America is under 40 years," he said. "If we could imagine construction materials that add positive value to ecosystems as they break down, we have a whole new paradigm for the way we approach buildings, at a time when we’re demolishing most buildings long before they wear out." Danhem was also able to devise a multifunctional use of these fungi where they can be used to grow large objects but also be able to bear its delicious fruit. 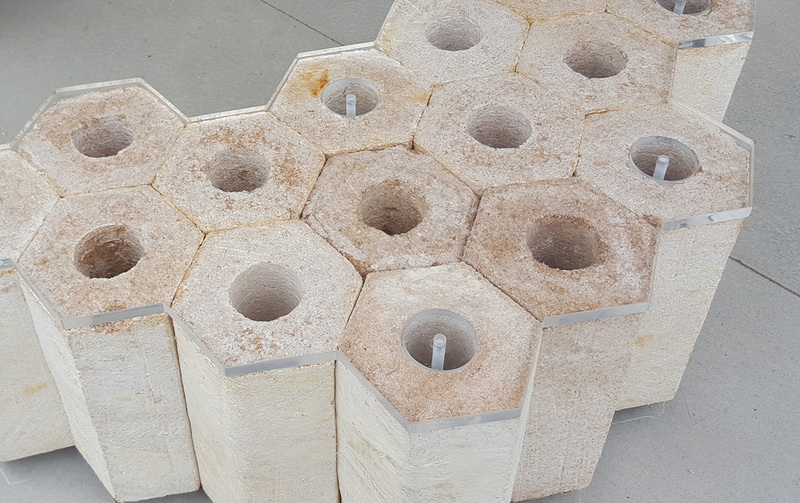 He put a hole in the centre of these mycelium biocomposite blocks to allow the mushroom to fruit in the place provided in the benches. It will be visible to the people as it’s contained, but won’t get on their clothes when they sit down. These chairs offer a unique design that is eco-friendly, unconventional and useful, all at the same time. Danhem and Frid-Jimenez, along with their team, did a magnificent job in providing relaxing benches to their students but with a vision of using this core material in more large-scale installations. The architectural and industrial future surely looks bright and environmentally safe if designers continue to successfully substitute the toxic substances with more organic materials. All images courtesy of AFJD Studio.